Our recent update makes the process even easier. In this update we added a new file-selection interface so you can quickly select your last 10, 50, or 100 files. It automatically compares the versions of the files, so you can decide which one you want to keep, allowing you to store a separate copy or replace existing files. To get these new features and functions, run WebUpdate. To open Sky Box close all reports and go to eServices > ACI Sky Services > Sky Box. Enter your Sky Box login credentials and follow the on-screen prompts. Keep an eye on your inbox as we continue to raise the bar in appraisal technology. Next up, new features for ACI Analytics with Public Record and Listing Data. As always, we’re here to help you, just email onecall@aciweb.com or call 800-234-8727 if you have any questions. How do I import my ACI Report settings from another machine? You can import your previously exported ACI Report settings, templates and picklists using Sky Backup. Open ACI Report and close all report files. Click eServices > ACI Sky™ Services > Sky Backup. Enter your Sky Box login credentials and click Next. Click Import Settings. The following screen lists all available backups. Select the backup you would like to restore and click Next. Your settings, templates and picklists are downloaded from your Sky Box account and applied to your computer. When the import is complete, click Finish. Prior to import, you must export the settings, templates and picklists to Sky Backup from an existing ACI Report workstation. TIP: A Sky Box account is required. If you would like to receive your free 1GB of storage space for your office, or if you would like to purchase Sky Box cloud storage, please contact an ACI representative at 800-234-8727. TIP: Changes made to settings templates and picklists between the date they were exported and the subsequent date they were imported will be overwritten. It is recommended that current settings be exported prior to importing previous settings. How do I backup my ACI Report settings? You can backup your ACI Report settings, templates and picklists using Sky Backup. Open ACI Report and close all report files. Click eServices > ACI Sky™ Services > Sky Backup. Enter your Sky Box login credentials and click Next. Click Export Settings. The following screen gives you a summary of what is being backed up. Enter notes about the backup and click Next. Your settings, templates and picklists are uploaded to your Sky Box account. When the backup is complete, click Finish. Sky Backup is useful to use as a backup of your ACI report settings which can be very helpful for a new computer setup. You can also get the office in sync by saving your standard settings, templates and picklists to Sky Backup and importing them to other ACI Report workstations. Sky Backup integrates with Sky Box, which can also be used to store files and work folders. Sky Backup is an eService using your Sky Box account that allows you to export and import ACI Report settings, templates and picklists. Sky Backup is useful to setup new appraisers and machines in your office to have the same configuration settings. You can get the office in sync by saving your standard settings, templates and picklists to Sky Backup and importing them to other ACI Report workstations. Additionally, it can be used as a backup of your ACI Report settings, which can be very helpful for a new computer setup. Sky Backup integrates with Sky Box, which can also be used to store files and work folders. Note: To use Sky Backup, close all reports and click eServices > ACI Sky™ Services > Sky Backup. Enter your Sky Box login credentials and follow the on-screen prompts. Sky Backup is an eService that allows you to store ACI Report™ settings, templates, and picklists in the cloud. This useful file-storage tool makes setting up a new machine with the same configuration a breeze. You can also get your office in sync by saving your standard settings, templates and picklists to Sky Backup and importing them to other ACI workstations. 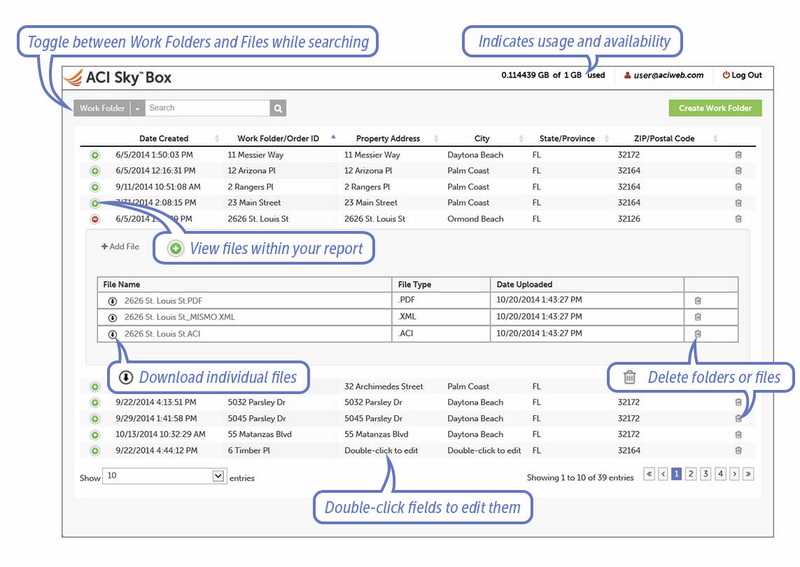 Sky Backup integrates with Sky Box, our secure online file-storage solution for appraisal files and work folders. To open Sky Backup, close all reports and click eServices > ACI Sky™ Services > Sky Backup. Enter your Sky Box login credentials and follow the on-screen prompts. If your company hasn’t registered for your FREE 1GB of Sky Box, give us a call today and we’ll get you up and running. To purchase additional Sky Box cloud storage, please contact an ACI One Call specialist at 800-234-8727. Note: You must have a Sky Box account to use Sky Backup. Have an idea for a new ACI feature or function? Just email our product team at ideas@aciweb.com, and we’ll add it to our project board. Check out the What’s New page to keep posted on the latest in feature releases – we have a ton of exciting features coming your way. For questions, give us a call at 800-234-8727 or email us and we’d be happy to help you! How many files can I store in ACI Sky Box? You can store as many files in ACI Sky™ Box as your account volume allows. Sky Box storage is measured in volume, not in number of files. You can purchase Sky Box storage as small as 5GB and as large as 1TB. An average appraisal report is around 3MB. With 5GB of storage, you could store approximately 1600 report files. To create a new Work Folder, click the Create Work Folder button. 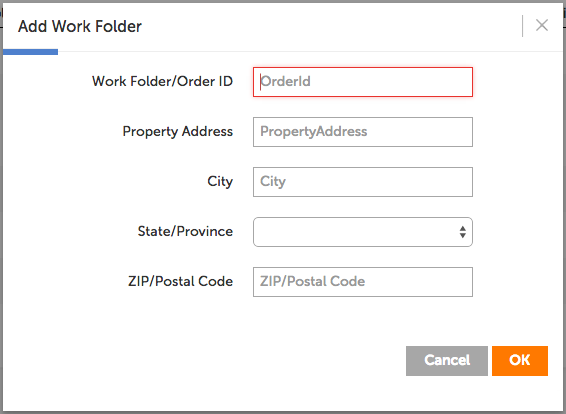 Complete the fields onscreen and click OK.
Work Folder/Order ID is required. Other fields are optional. In the Add Files window click inside the outlined area to browse for your files, or drag and drop them into the outlined area. The file names you selected will be listed under Files to Upload. 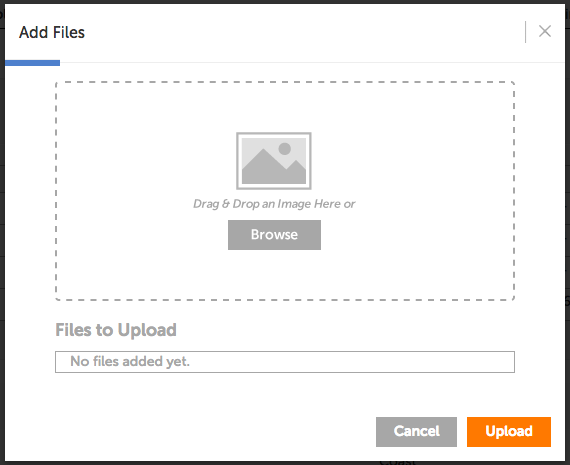 Click Upload to create the Work Folder and upload your files. Up to 100MB of files can be uploaded at one time. 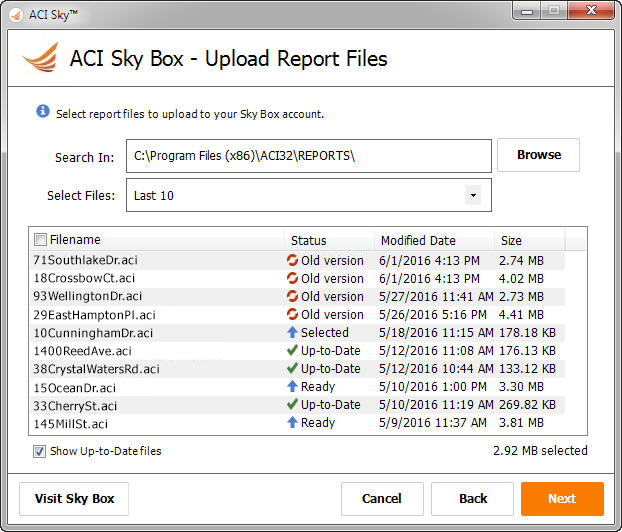 ACI Sky Box is a web-based appraisal storage solution on our secure, private cloud. Direct integration with ACI Report™ allows you to simply and securely archive your files. You can also upload and access images, notes, and PDFs – anytime, anywhere.